Bayeux is filled with the nostalgic charm of a city that was miraculously preserved from the bombings of 1944 during the World War II Allied invasion of Normandy (as was Honfleur). Two important conquests directly affected Bayeux: the conquest of England by the Normans in 1066, and the Normandy landings involving the Allied troops in June 1944. Bayeux was also the very first city to be liberated after D Day. 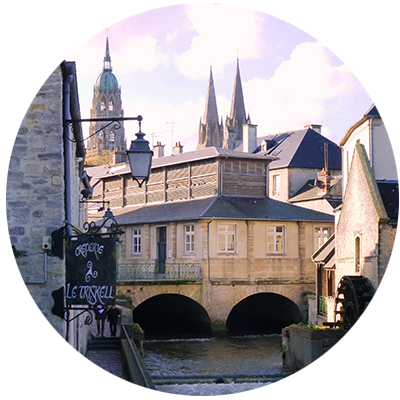 Bayeux maintains a remarkable architectural heritage. Surrounded by ramparts – still partly visible - the old city developed within the walls over the years, leading to great architectural diversity. At the very center of the charming old town, you will discover a magnificent cathedral. For centuries, Bayeux has kept a unique treasure: the Bayeux Tapestry from the 11th century, an enchanting medieval comic book. It tells the story of the Hundred Years’ War between the French and the English, more specifically during the conquest of England by the Normans. The tapestry is 70 meters (nearly 77 yards) long and is protected by UNESCO. Due to its central location between Honfleur and Sainte Mère Eglise (and quite close to Caen), Bayeux is the perfect place to stay and always come back to at the end of each day. We can offer you accommodation that fits your desires. If you want to stay in the old town and be able to walk everywhere, we have selected a couple of Bed & Breakfasts in the center of the old town. If you would rather be in a quieter environment with a spacious garden, we have handpicked splendid houses and manors in the peaceful countryside, only 2 to 5 miles from Bayeux. You may want to check our self-guided tours taking you through Normandy.